Erin Keefe and Osmo Vanska take a bow after their performance as part of a quartet in Orchestra Hall's atrium Saturday night. The two wed Easter Sunday. Photo by Tim Campbell. On Easter Sunday, Minnesota Orchestra music director Osmo Vanska and concertmaster Erin Keefe were married in a private ceremony. The couple's engagement was announced, via Facebook, in early January 2014. The two orchestra VIPs have not released any details or photos from their nuptials. The orchestra released a brief statement acknowledging the wedding and adding, "we wish them all the very best." While the newlyweds kept their plans quiet, a couple hundred music lovers got advance notice following Saturday night’s Minnesota Orchestra concert. 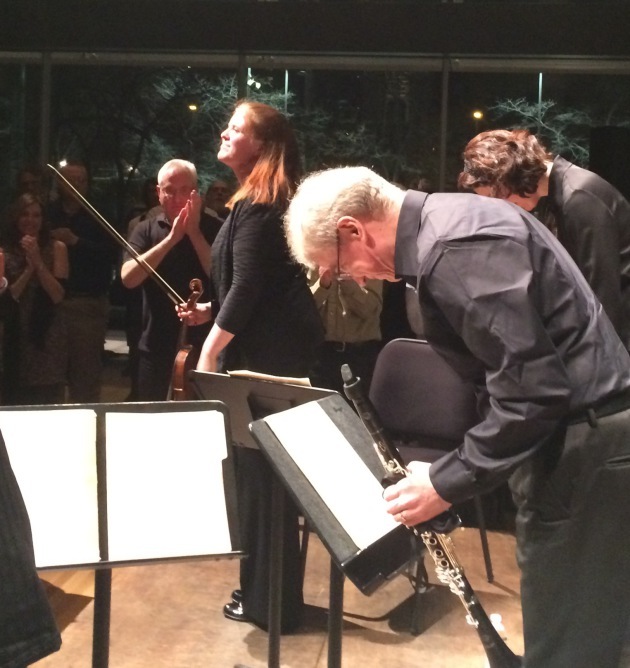 While introducing a post-show bonus performance of Olivier Messiaen’s “Quartet for the End of Time,” featuring Keefe and Vanska (on clarinet) in Orchestra Hall’s atrium, principal cellist Tony Ross casually mentioned that the couple were to be wed on Easter Sunday. The pair reacted with reserve, but earlier in the night Keefe’s husband-to-be gave her a decorous smooch on the cheek after her mesmerizing solo work on Vaughan Williams’ “The Lark Ascending,” the highlight of the first concert in the orchestra’s month-long “Spirit and Spring” series.